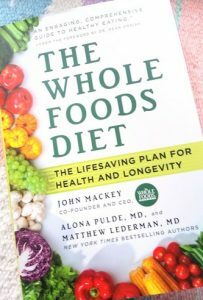 Imagine my delight when the team working on John Mackey’s new book The Whole Foods Diet: The Lifesaving Plan for Health and Longevity contacted me, eager for a meeting to discuss including references to The Plant-Based Journey in the book. Here is the message I received. 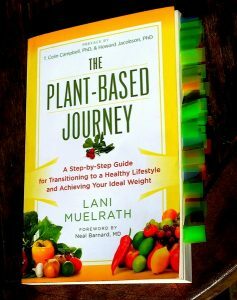 I include it here because it gives great insight into what The Whole Foods Diet book is all about, and how it adds to the growing collection of books on whole-foods, plant-based nutrition available today. The book’s goal is to make an accessible, science-based case for a whole foods, 90%+ plant-based diet, and to synthesize the amazing body of science and wisdom available to us today on the topic. We also want to feature many “whole foodie heroes” as we’re calling them, people who have been and continue to be instrumental in this movement. We want to emphasize how much they all have in common, rather than the small differences that sometimes get over-emphasized. Our goal is to be inclusive and flexible, not dogmatic…and to use the wonderful opportunity we have with Whole Foods Market backing this book to get the message out to a very wide audience. Evidently John Mackey himself – CEO of Whole Food Markets – had read The Plant-Based Journey and directed the team to reach out to me in researching and writing their book. This was very exciting to hear – for as you probably well know, The Plant-Based Journey has been recognized for being inclusive, undaunting, and user-friendly. Yay! Imagine also my delight when Ellen and I met up a natural foods bistro for the interview – and there on the table was her copy of Journey, all book marked and sticky-tabbed. I had to take a picture to share with you, of course! There’s Ellen’s copy, photo left. 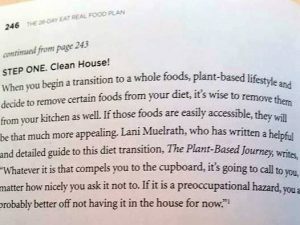 The Whole Foods Diet Book was just released this week – and my copy arrived a couple of days ago. And that means I’ve been able to read it and report back to you! It is a splendid fulfillment of the vision for the book that Ellen first described to me. You’ll find in-depth descriptions and analysis of what constitutes whole foods, how to recognize them, procuring them, and how to get started on preparing them. Several sections underscore what you’ll find in Journey as well: for example the processed continuum, and why whole plant foods are the best match for our gut receptors when it comes to being full in a way that doesn’t contribute to a weight problem. Scattered throughout are vignettes titled “whole foodie heroes” – you’ll see many of your favorite leaders on the collective whole foods plant based journey profiled – T. Colin Campbell, Neal Barnard, Dean Ornish, John and Mary McDougall, Brenda Davis…Even Pete Singer and Dan Buettner of The Blue Zones fame are highlighted (including several pages devoted to an overview of the blue zones themselves), and yours truly made the list as well. And of course, one of my favorite pages in the book is page 246 (see right). Forgive me for having a Plant-Based Journey moment! 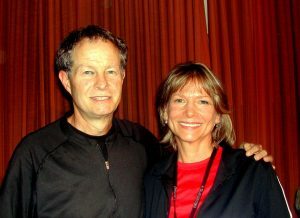 Anecdotally, I met John Mackey several years ago at the 2012 McDougall Advanced Nutrition Study weekend – when the photo at right was taken. That was the weekend of the great Fuhrman-McDougall debate, which Mackey skillfully moderated. It was the same weekend that Mackey met Alona Pulde and Matt Lederman of Forks Over Knives fame, his co-authors of The Whole Foods Diet. He talks about this in the book, describing his initial meeting with Matt and Alona, and how it quickly grew to a professional, plant-based relationship. Reading Mackey’s personal journey from Standard American Diet to now healthy vegan, which he details in the book, is engaging and interesting. He discusses how his personal practices and philosophy interface with and shape his business policies. Overall, this a wonderfully informative whole foods diet primer with lots of bells and whistles – many great recipes, tips for changing to whole foods, disease preventative properties of whole foods nutrition, and several personal transition success stories. In the back, you’ll also find a 28 Day Eat Real Food Plan, complete with menus and recipes. And P.S. 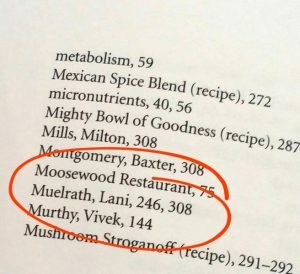 It’s the first ‘indexing’ I know of yours truly – right there between Moosewood Restaurant and Murthy Vivek, Surgeon General of the United States! A nd P.P.S. Another highlight of this whole (!!) 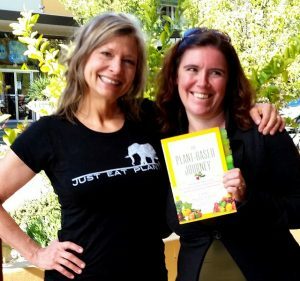 experience has been the opportunity to meet up with Ellen Daly (photo left, along with her marked-up copy of Journey) who along with husband Carter did much of the heavy lifting for The Whole Foods Diet. Sit two authors down together and, well, time flies. 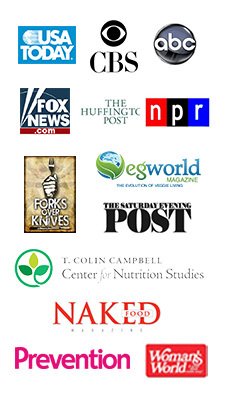 Congratulations Ellen and The Whole Foods Diet team – John Mackey, Alona Pulde and Matt Lederman (you’ll recognize these two M.D.s from Forks Over Knives – the movie and the books), and Carter Phipps – on your fine work! 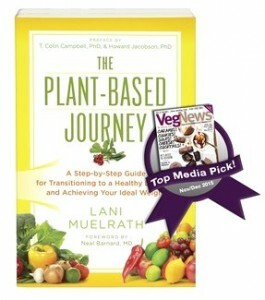 How great to see this new book – and how great that you and Plant-Based Journey are part of it! I’m not surprised, especially since you have such a positive way of presenting the message and working with people. Is the book available at the Whole Foods stores? I’ll be sure to take a look next time I’m there. Thank you for sharing this, great article! Yes, my understanding is that this book is on the floors at WF Markets. Let me know if you find it at your local store and what you think! As always, your kind, supportive enthusiasm is wonderful to receive. Thank you! And thanks for posting, too. I’m VERY disappointed in the new WFM that opened in the SouthHills of Pittsburgh, PA, after waiting for almost two years for it to be built. I was so excited when it opened but my expectations were quickly dashed. Very few whole foods for healthy WFPB’d people. The hot food bar has few vegan options and those that are there are loaded with oil; often the food on the bars are not labelled — how hard can that be? Only one cereal is whole grain and without sugar. There is NO vegan yogurt starter (! ), no whole grain burger buns, the vegan pizza doesn’t have a whole wheat crust and is often very burnt, and on & on. It would seem that the WFM CEO talks the talk but doesn’t walk the walk. Yes, I have complained (nicely) at the office. Once, they laughed at me. I won’t go back. Trader Joe’s isn’t vegan-oriented but at least they treat me (and all their customers) as if I’m their favourite customer! If I want to be treated poorly I can just go back to our local big grocer, Giant Eagle, which specializes in poor customer service. WFM is vying with them for that title. Honestly, my experience has been primarily positive. And I think of all the people who have been reached and whose plant-based, vegan lives have been made easier by the presence of WFM! I live in a remote area without access to such abundance in a marketplace, so to me a trip to WFM is wonderful because of all the options! Great article, and glad you were interviewed for the book. You live it, and inspire. Mindfulness retreat? Kinda jealous! Care to share any details or recommendations? Happy Easter, and safe travels. Thanks Mary! Your kind words and thoughts always, always appreciated! Yes, luck me! Here’s my home for the week: I always recommend Spirit Rock! Jack Kornfield it leading, one of the pioneers of the mindfulness meditation movement in the US – so very popular event. Still waitlisted, no matter how early you sign up! I’m happy to have secured a spot! 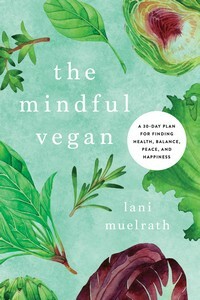 Hi, Lani, I enjoyed your books very much, yet find myself perturbed with the lack of no oil options at the Whole Foods salad bars. Believe me, I have been to many many Whole Foods markets as an only vegan option, and find frustration with this obvious lack. Dr. Fuhrman seemed to try his best to encourage this option with the Health Starts Here posts in the store and other helpful pamphlets like his Andi Score listings of foods. Yet, please let Mr Mackey know of this obvious dissatisfaction among my other vegan plant based friends as well. To clarify, I am referring to the hot bar where olive or grape seed oil is added to the beans or stews. I realize not every wants to omit processed oils. I am requesting at least one option oil free for others. Thanks for sharing your experiences and observations. I too have experienced both the delight and frustration of eating at WFM. On the one hand, they do have some wonderful salad bars, and sometimes – though it seems to depend on the store – oil-free dressing options. I don’t tend to eat much at the hot food bars – or at WFM in general anyway, as there isn’t one nearer to home than a two- hour drive – but I too have been happy to see beans or hot salads in the trays only to see some additions I’d rather weren’t there. Have you left suggestions in their suggestion box? Do they have one? Must check next time! If you get a chance to look at Mackey’s book, you’ll see he advises against the use of oils and follows a whole food vegan diet himself. He also explains why commerce necessitates carrying many items in WFM that are not personal options. PS. Hope Mr Mackey is aware of the criticisms concerning at least one oil free choice for vegans at the hot bar. Certainly Karin. My heart goes out, it can be so frustrating sometimes to just get something basic and delish as well as healthy! Hopefully WFM offerings will move more and more in this direction. I also find myself wondering if some of these things are regional. Here in CA the options are pretty good – so maybe there is some public demand involved? Thanks for the great conversation and kind comments!